At Restore SD Plastic Surgery we are excited to offer Silk Peel Dermalinfusion – a unique noninvasive skin treatment that is first in class. 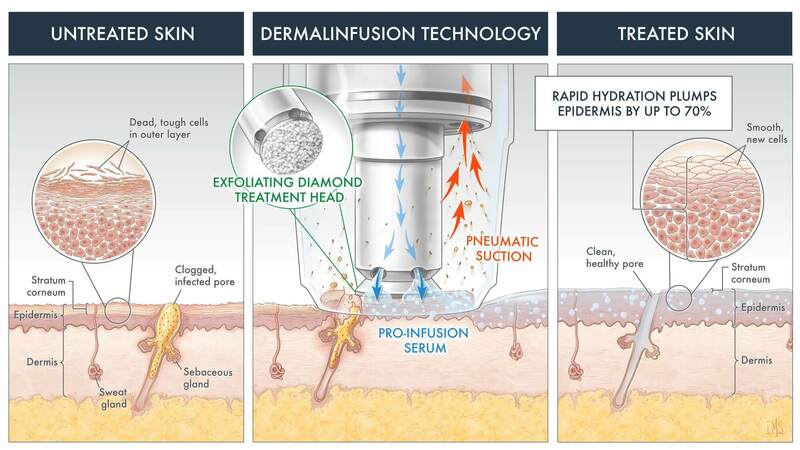 Dermalinfusion’s unique 3-in-1 patented technology simultaneously exfoliates, extracts, and infuses skin with targeted serum solutions, delivering advanced hydration and superior results. With so many treatment options available it can be overwhelming to sort out the best treatment for you and your skin’s needs. Another popular option in medical aesthetician’s offices is the HydraFacial. This treatment also cleanses, exfoliates, and hydrates. Instead of microdermabrasion, the HydraFacial chemically exfoliates the skin using salicylic and glycolic acid. The serums used are housed in large multi-use containers that may decrease in efficacy over time as they are exposed to air and light. Like the Silk Peel Dermalinfusion, the HydraFacial treatment takes about 30 minutes and there is no downtime. The Silk Peel Dermalinfusion combines microdermabrasion and the patented technology of dermalinfusion. A diamond tip with a comprehensive range of treatment handpieces and varying strengths provides a highly customizable treatment that can be tailored to your skin needs and sensitivity. By selecting the appropriate grade of microdermabrasion (from 0 to 140 grit) we can ensure the appropriate level of exfoliation. The patented technology infuses serum as it exfoliates the skin, which ensures the deep delivery of key ingredients. The simultaneous infusion is critical because the skin is most penetrable just after exfoliation of the stratum corneum. At Restore SD Plastic Surgery we offer four different infusion serums that are individually prepackaged along with disposable treatment heads to ensure fresh solutions and no cross-contamination between patients. There is a hydrating serum, a clarity solution for acne prone skin, the patented Lumyxl brightening serum, and a Vitamin C serum. Suitable for all skin types and tones, the Dermalinfusion addresses multiple skin concerns, including hyperpigmentation, dry skin, aging, and acne. Skin treated with Silk Peel Dermalinfusion volumizes the skin by 70% – your skin appears plump and firm with fewer lines and wrinkles up to 72 hours following a single session. The treatment takes only 30 minutes with no downtime. A series of treatments in conjunction with a skin care regimen that includes sunscreen optimizes results. The better treatment in our opinion and the one we recommend at Restore SD Plastic Surgery is Silk Peel Dermalinfusion. You should always consult with a Physician or Aesthetician before beginning any treatment regimen. Our knowledgeable and experienced staff are here to provide complete skin analysis. Visit the office to discuss with Erin Murphy, our experienced aesthetician, the innovative Silk Peel Dermalinfusion. Call today to book your skin care consultation!